Forced draft oven capable of maintaining 437°F (225°C), more than adequate for both short-term aging of asphalt samples and heating aggregates, asphalt binders and equipment for use in ASTM D6925. The .7ft3 (198L) capacity provides ample room for all applications. The oven features a calibrated dial-type temperature controller (model H-30145) or a digital PID microprocessor temperature controller (model H-30145E). These ovens are constructed of corrosion-resistant, aluminized steel interiors and exteriors coated in an exclusive "hightech" bronze polyester finish. The large, high-impact thermal plastic door handles provide durability and remain cool-to-the-touch during operation. Ovens come with (2) heavy-duty, chrome-plated wire shelves, which can support 80 lbs. (36kg). Dimensions are: internal chamber: 26" (H) x 20" (W) x 26" (D) (660 x 508 x 660mm); external dimension 33" (H) x 24" (W) x 32" (D) (838 x 610 x 813mm). 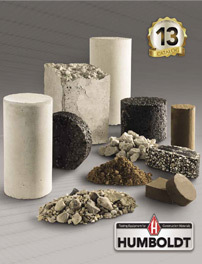 Economical Gyratory compactor provides accurate and repeatable testing of asphalt mixtures. The H-1640B.4F PAV takes the hassle out of running and documenting asphalt binder aging operations.